For those using ToodleDo, it needs no introduction. 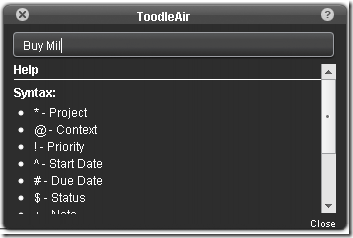 If you are new to it, check out my ToodleDo online task manager review here. ToodleDo has really helped me with managing my tasks with me loosely following the Getting Things Done principle. However, I wanted an easier way to input my tasks as I came across them instead of launching the browser and adding it to to ToodleDo web interface. ToodleAir was just the solution I needed. Once you have the Adobe AIR app running, it neatly hides in the side. You just mouse over the area to pull it out and start typing the task. You can add the following shortcuts to add Project, Context, Priority, etc right from the terminal like command window. The cool thing is that it auto fills for entries like project, context, and status as you type. This is a great way to quickly enter tasks to ToodleDo without having to break your current concentration. You can download ToodleAIR for free. 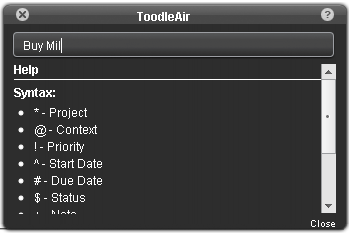 One thing about ToodleAir is that the developer of this app has discontinued support and released the source code for it for anyone to develop it. However, it works well with the current ToodleDo and I love it.